The keynote conference lecture will be given by the internationally-renowned author on modern spirituality Anthony Peake, whose most recent book Time and the Rose Garden discusses previously unpublished Priestley writing on time and humanity. John Baxendale will then explore Priestley’s experimental drama in relation to his ‘broadbrow’ ethos, linking popular and elite culture. There will be detailed reassessments of three of Priestley’s boldest dramatic experiments of the Thirties: from Michael Nelson on Time and the Conways, from Lee Hanson on Johnson over Jordan and from Ken Smith on Music at Night. Tony and Jenny Reavill will present dramatized readings from, and commentary on, the Jungian ‘platform play’ Dragon’s Mouth, co-authored by Priestley and his wife Jacquetta Hawkes. Either send a cheque made out to the J B Priestley Society to: Andrew Greathead. Hon Treasurer, J B Priestley Society, 81 Southam Road, Hall Green, Birmingham B28 0AA or book online through Eventbrite. Open to all who are interested, with ample discussion time throughout. 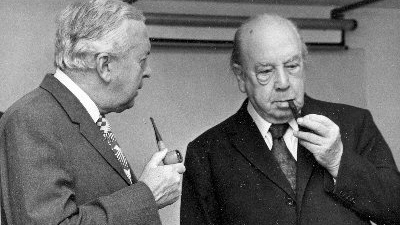 Conference fee: £18 for J B Priestley Society Members, £25 for non-members. (Price includes tea and coffee: sandwich/soup/snack lunches can be purchased from the IABF Café on the day. Venue is seven minutes walk from Oxford Road Station. Turn left from the station approach along Whitworth Street, cross Great Marlborough Street, and turn left again on Gloucester Street which, curving under the railway bridge, turns into Cambridge Street. Chorlton Mill is on your left with the IABF sign prominent at the far end). Special thanks to Special Collections, University of Bradford for the use of archive imagery.